Chip and dip sets were offered over the years either as seasonal promotionals or limited time special offers. Promos were comprised of bowls in non-standard patterns. Specials were typically the same 4 quart and 1-1/2 pint bowls found in standard pattern 400 round or 440 Cinderella nesting mixing bowl sets. An exception is the Early American set, whose 441 dip bowl is gold/brown rather than the brown/opal included in the 440 set. For most sets, a brasstone, formed metal bracket served to hold the dip bowl elevated above the larger chip bowl. 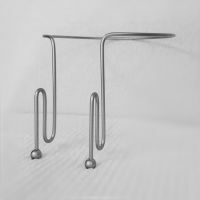 Three different style metal brackets were seen included in the various sets. An exception is the 1980 "Stack 'n' Snack" promo set which uses a round wooden disk with a curved groove to serve as a platform to hold the also atypical 708 tableware dip bowl. If you want to collect original Pyrex chip & dip sets, you'll want to know which bracket came with which. Brackets were often separated from their sets and misplaced, so finding a set with its bracket is more-often-than-not a rare occurence. Reproduction brackets are seen online, but are typically somewhat expensive. "Girdle ring": A contiguous length of wire with ball-capped ends S-shaped to clamp on chip bowl rim. Ring is sized to hold dip bowl about midway below top rim/handles. There is evidence to suggest there may be more than one version of this bracket. Early advertising shows the supporting wires spaced very widely apart with the ring positioned high, just under the Cinderella 441 dip bowl's handle/spout. 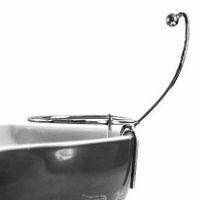 In other instances, the bracket is seen with the supporting wires spaced approximately two inches apart, but with the ring positioned approximately mid-bowl. Since the tempering of the wire is such that successfully bending it wider or narrower permanently is unlikely, the assumption of more than one version is plausible. This style bracket is only seen on 444/441 based sets. "Foot ring/hook": Four formed wire pieces welded together. Support wires are S-shaped to clamp on chip bowl rim and are bare-ended. Dip bowl foot sits in/on a small ring. An upcurved, ball-ended hook secures bowl by top rim. This style bracket is seen on both 404/401 and 444/441 based sets. 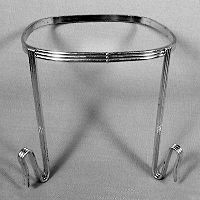 "Grooved band": Flat, grooved metal stock, S-shaped to clamp to chip bowl, with a round or square ring sized to hold dip bowl under rim (round) or midway down from top (square). There is evidence to suggest there may be two versions of the 025/410 Cinderella Snack & Dip bracket, one being taller than the other. While brackets of other design may be seen identified online as original Pyrex, their claims to authenticity are dubious. Note the 1958 Hot 'n' Cold is unusual for its 403 rather than 404 chip bowl. An 025/410 set is also known in Bluebelle tinted Pyrex, likely ca. 1960 or thereabouts, but its status as a regular production item is uncertain. As you can see, Pyrex chip & dip sets enjoyed popularity throughout the late 1950s and 1960s to the early 1970s. Stack 'n' Snack, sold from the last half of 1980 to the first half of 1983, appeared to be their last hurrah. Obviously, any two appropriate size and model bowls and bracket can be utilized in a chip/dip arrangement, but it should not be assumed they were originally sold that way. Any purchases you make from Amazon can help support this web resource. Click to find out how. This site is a participant in the Amazon Services LLC Associates Program, an affiliate advertising program designed to provide a means for sites to earn advertising fees by advertising and linking to Amazon.com or its affiliates.